AirPouch® FastWrap™ Bubble on Demand Packaging Materials from Automated Packaging Systems offer a flexible, durable form of protective packing. Our FastWrap products secure and cushion your products while in transit, reducing returns and increasing customer satisfaction. FastWrap Bubble on Demand is pre-perforated every 10” so the packer can select the right amount of material. The channel-filled honeycomb design allows for multi-directional wrapping and improves product protection. AirPouch FastWrap tubes are used in block-and-brace applications, and feature our exclusive EZ-Tear™ perforations between each tube, making them easier to separate while decreasing product waste. Both products are available standard in biodegradable and recycled EarthAware™ films, as well as DuraClear 2000™ LLDPE. All three materials pass the CID-A-A-549D and ASTM D-2221 standard of less than 20% air loss over seven days. FastWrap bubbles and tubes are conveniently boxed to reduce changeover rate and increase run time. This also dramatically reduces the storage requirements found with paper, foam and pre-filled bubble materials. 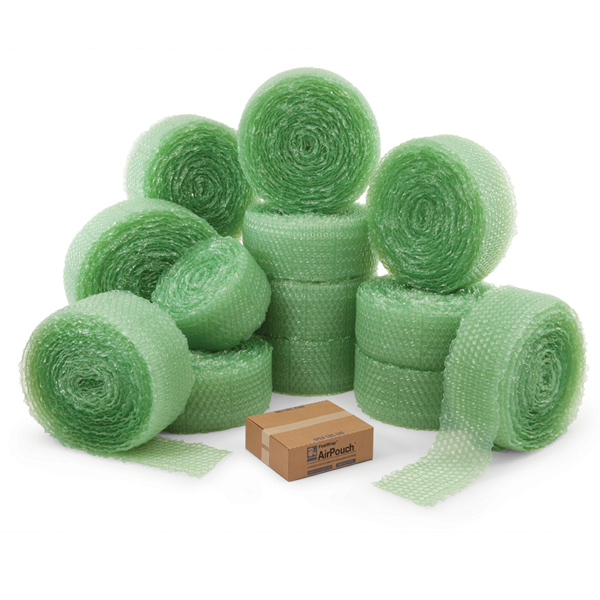 One small box of FastWrap cushioning bubble produces 5.5 rolls of competitive pre-inflated bubble, reducing the high cost of shipping and warehousing.